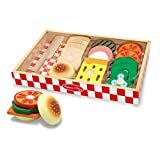 16-PIECE SANDWICH SET: The Melissa & Doug Sandwich-Making Set includes 16 wooden sandwich ingredients, a handy wooden storage tray, and a wooden knife to slice pieces apart. CONVENIENT STORAGE: To keep your valuable sandwich ingredients organized, the Melissa & Doug play food sandwich set includes a sturdy wooden storage tray. HIGH-QUALITY MATERIALS: Our play food sandwich set is made of high-quality materials, which ensures durability and safety. The wooden pieces are sized for smaller hands for ease of use. GREAT GIFT FOR KIDS 3 TO 5: This set is an exceptional gift for kids ages 3 to 5 years. Add the Melissa & Doug Pizza Set to round out the pretend play experience and give kids an engaging option for screen-free fun.